We returned to Sucia Island again the weekend of Sept 10-11th. (see first trip: Scallops and Tigers and Nudis - Oh My! 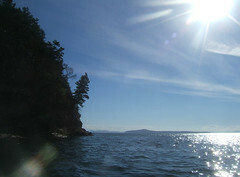 Sucia is one of the northernmost San Juan islands. This time we came in force and loaded for "bear", or nudibranchs anyway. We were apprehensive about the weather, as it poured rain on the drive north, but cleared by Mt. Vernon and was beautiful, except for just a little rain at night. Fellow Marker Buoy Club member Greg Wilson has a fantastic, bright red 16' Zodiac with a 25HP motor, just made for diving. He, Chip Petit and I loaded it with 9 tanks and all our dive gear, then towed it behind my 28' sailboat Maggie May. It was dubbed the Dive Barge and probably weighed over 1200 pounds loaded. The cool thing was that even loaded, it still towed well enough to sail and we had a good time going and coming! Greg and I feel like we've worked out a great solution for diving; I have the comfortable "bunk house" and he has the fast dive platform. The Zodiac easily got up on plane with 3 divers, gear and 6 tanks. Steve Lodge and his boat along with his son, girlfriend and Carl Baird met us up at Sucia on Saturday morning. We dove at Little Patos Island across from Sucia and then back to Lawson Bluff on the north side of Sucia. I wasn't too impressed by Little Patos, but I think we dove too far away from the point. Visibility was excellent, really opening up nicely to 40-50'. We saw lots of Copper rockfish and small invertibrates. The only bummer was when Greg was pulling his rig off, he managed to snag and loose his Cochran wrist computer into 150' of water. For the second dive, we did Lawson Bluff again. I'm getting this site wired and have found the perfect little cove to pull into, put our gear on, and do an easy shore dive from the rocks. We also found a treasure trove of scallops there and collected a bag of Pectins for an or'sderve! The depth is easy and we found lots of photo subjects. Lawson was a much richer site, lots of Dendronotus nudibranchs, Copper and Puget Sound rockfish, with a few large Ling Cods cruising by. 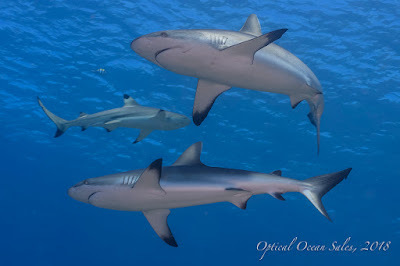 I shot macro on both dives, yet with the visibility opening up nicely, I'm starting to yearn for a wide angle lens, it was much better than two weeks ago. We were going to get up and do an early dive on Ewing Island, but were lazy and just decided to have a big breakfast and head home; spending the early afternoon sailing and enjoying the sunshine!